This marks the 100th installment of Ice Time. 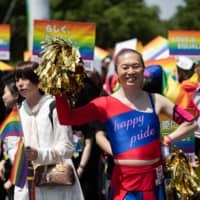 The column is now in its eighth year after beginning on May 18, 2008, with a look at skaters trying to save ice rinks in Japan. To commemorate the milestone we have a special interview with retired star Yukari Nakano, who is currently a director in the Sports Division at Fuji TV. 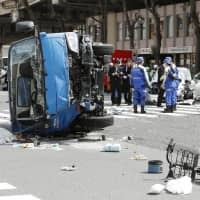 Nakano, now 29, has been working with the company since 2010 after earning both undergraduate and master’s degrees from Waseda University in Tokyo. Five years removed from her last competition, the native of Konan, Aichi Prefecture, looks like she could put the skates back on now and be a factor. The beauty and radiant smile she was famous for are still present. 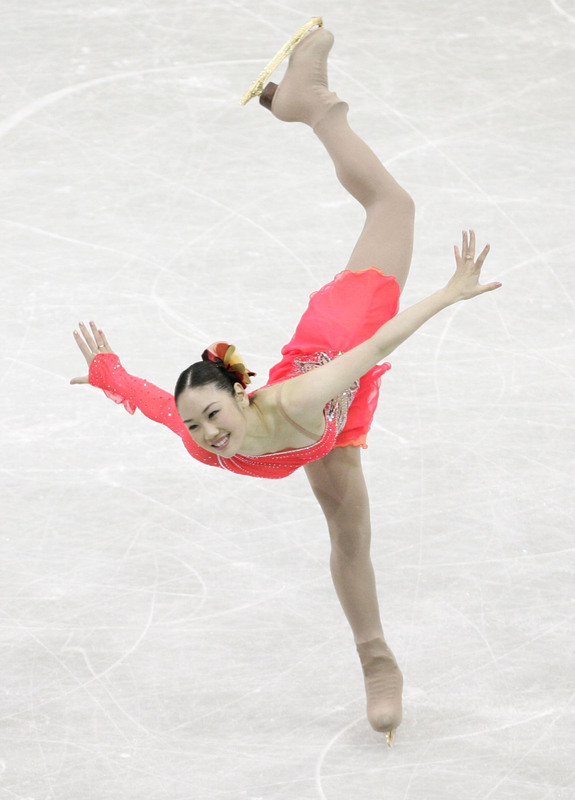 Nakano’s story is one of persistence both during her skating days and afterward. She struggled without a sponsor until late in her career, largely relying on her parents for support. I can still recall the day I took my young daughter skating at a public session at the Shin-Yokohama Skate Center and found Nakano practicing in the center of the ice as the rest of us skated around in circles. That incident has always resonated with me as it illustrated that she was willing to put in the necessary work under any circumstances. Japan Times: Tell us about your job and duties at Fuji TV. Yukari Nakano: I work in the Fuji TV Sports Division. Previously I was going out and talking to figure skaters and putting them on television. My job changed last year. I am a director/journalist now. Sometimes I appear on camera. I’m doing the budget management and general affairs for our sports programs as well as the coordination with the company’s other divisions. My job is to coordinate and prepare the environments that are necessary for our staff at the sites to make their programs. You could have continued as a show skater for many years, but chose to retire and start a new career. Why did you make this decision? I always liked to watch TV when I was growing up and have always been interested in the job of media. The reasons I chose TV over newspapers or magazines was because I felt it has a lot of potential in conveying messages to people. 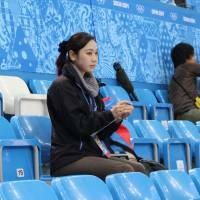 When I first interviewed Nakano, seven years ago, she said that she wanted to get into the media business after her skating days were over. Fast forward to the present day and it’s mission accomplished. I’m here now. I have realized my dream and reached my goal. Much has been made recently about more women joining the workforce in Japan. Do you think you will continue working after you have a family? Of course I will. I especially like to work. By doing it I can avoid getting senile when I get older (she said with a laugh). Work can also have a positive impact on your private life as well. Many athletes struggle with the transition to work after retiring, but you have not. What has been the reason for this? It has not been as easy as it has looked. Previously as a skater I was in the spotlight and now I am behind the camera. That transition wasn’t necessarily smooth. I have had a lot of difficulties to overcome. This is something all athletes face. This kind of wall. But once you get over the hump it becomes easier. I have developed my awareness to become part of making TV programs. I have grown a lot. It has been five years since I retired from competition. It is tough for any athlete. Right now Mao-chan is going through the same situation. When it comes time for her to decide to retire, it is going to be a difficult thing. 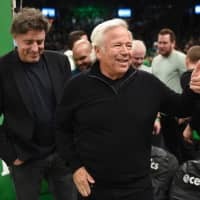 You have chosen to work primarily behind the camera when most former athletes work in front of it. Why did you choose this path? I have always liked sports. I have always liked watching TV. However, being behind the camera is tougher than I thought it would be. How often do you skate now? Almost never. With my job now I just don’t have the time. Do you still get offers to skate in shows? At times I do get offers to skates in shows, but I prioritize my job at Fuji TV. If it doesn’t affect my job, I try to take those offers, but everybody remembers me from my days as an active skater. Obviously I am not that good anymore without practicing. It’s not that I don’t want to show myself, but it is tough from the technical side. You have been retired for five years now, but whenever I mention your name people still say “Donut Spin.” How does this make you feel? I’m very happy whenever I hear this. A lot of people remember me and associate me with the Donut Spin, which makes me feel good. Twice (in 2006 and 2010) you narrowly missed making the Olympic team. How did you get past these disappointments? A lot of time has passed. That happened to me a long time ago. I do wish I could have gone to an Olympics. I often do think, I could have done it or would have done it, stuff like that. When I worked at the Sochi Olympics I thought about this, but I just tried to focus on my job and convey the message from the site to the audience. What were your thoughts when you saw your contemporaries like Mao and Akiko Suzuki skating in Sochi? My biggest emotion was to support them — both as a reporter and a former skater. I just wanted them to do the best they could for the Japanese team. 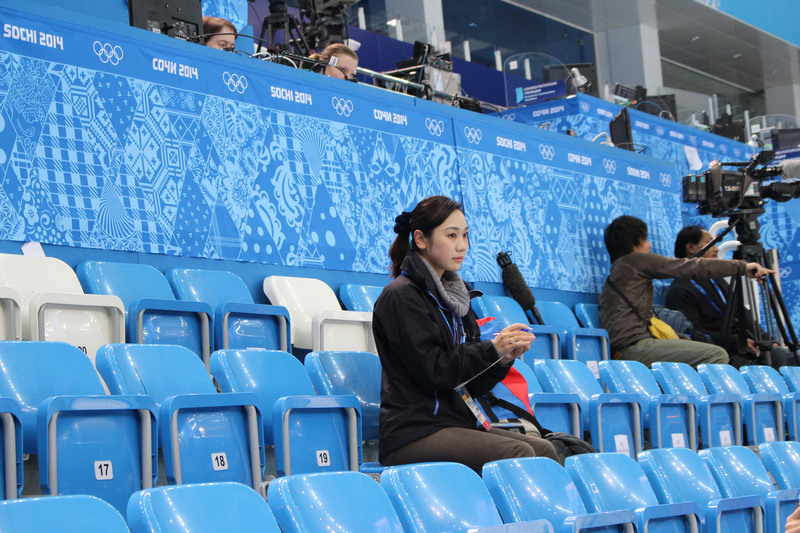 You can’t really do much at the Olympics but talk to the skaters in the mixed zone and support them from the stands. Even several years after retiring, you are still one of only a handful of women who have landed the triple axel in competition. How does that make you feel? If you look at the sport now, in the mainstream the skaters are required to do a triple/triple combination more than a triple axel. If you look around the world now, not many can do a triple axel. So that tells me that I was able to perform a very difficult technique. The triple axel is a must now for the men with so many of them doing quadruple jumps. Many skaters go into coaching after retiring. Was this something you ever considered? Not really. Me, being a skater, I was practicing a lot. If I was a coach, I might ask the same of my skaters. But everybody is different, especially when it comes to character, so I thought coaching wasn’t meant for me. If my friends ask me to teach their families skating, I will do it. But in terms of teaching at the top level, that is not going to be me. Tell us about how you began skating. I was actually 3 when I first pulled on the boots. At that time my older brother and sister were skating, so it just came naturally for me to do it. It is natural when you have an older sister to try and catch up to her. When my sister retired, it was my turn to chase the skating career. What do you miss the most about your time as a skater? The preview shows now still show some of me skating from back in the day and this makes me feel good. That was the so-called “golden era” of skating. By watching and practicing with the other skaters back then, I feel like I grew up together with them. What skater would you say was your best friend when you competed? I still keep in touch with a lot of skaters. I talk to Shizuka Arakawa when I see her working at the skating, and Miki Ando, who appears on TV shows a lot. I also keep in touch with Nobunari Oda. I cherish these relationships. When I see some of the foreign skaters at competitions, they talk with me and tell me about their families. What was the highlight of your skating career? Every competition was important for me, but if I had to pick one it would be the 2008 world championships in Sweden (where she finished fourth). The standing ovation I got after my free skate is really memorable. It is always nice when you get a standing ovation, but in this case it was not just Japanese people. It was people from all around the world who gave me the applause and that made it a really special moment. What do you think separates good skaters from great ones? That is a tough question. When I was skating, it was tough for us just to get to the world championships. When you look at the Japanese team now, it has developed a lot and they regularly go to the worlds. What advice would you give to young skaters coming up who want to compete on the elite level? It depends on what kind of age groups you are talking about. I would say just practice as hard as you can. Growing up in Nagoya, I used to practice at the same rink with Mao-chan, Miki-chan and (Takahiko) Kozuka-kun. One thing we all had in common was the length of the practice. They would do their best. You can’t dislike the sport. You have to work hard. Why have so many great skaters come from the Nagoya area? This may have been the case previously, but now you have good skaters coming from all over the nation. I think a lot of it had to do with tradition and watching skaters growing up. People like Mao and Miki saw Midori Ito (1989 world champion, 1992 Olympic silver medalist) and Kumiko Koiwai (1993 world junior champion) competing and they inherited the tradition. I think that has a lot to do with it. Now Kanako Murakami is one of Japan’s top skaters. Even before Mao debuted as a senior she was practicing together with Kanako. That was important. Kanako said last year at the Sochi Games that she thought the reason Nagoya had so many top skaters was because of the “scary moms” that look after them. This is true. But I think it is probably the case everywhere kids skate. My mother used to drive me back and forth to practice. If it wasn’t for her, I would not be where I am now.